Photo: © 1975 John F. Turner. 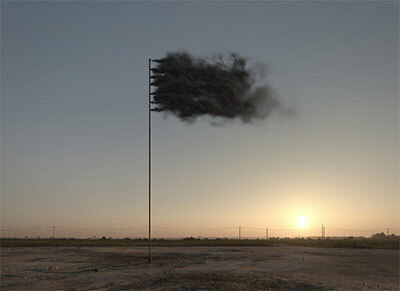 John Gerrard, Western Flag (Spindletop Texas), 2017, 2017, simulation, Courtesy the artist and Simon Preston Gallery, New York & Thomas Dane Gallery, London. 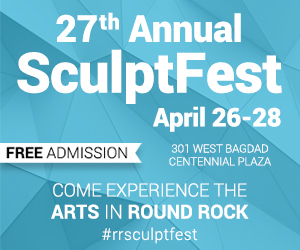 The opportunity to see film and video in art museums in North Texas has been rare, a fact that is not surprising given that serious consideration of time-based media on the part of any museum was essentially non-existent until the early 2000s. Artists, however, have been experimenting with the medium ever since the technology was invented, and it seems about time museums caught up. When Senior Curator of Contemporary Art Gavin Delahunty arrived at the Dallas Museum of Art several years ago, he started exploring the collection as a whole and looking for different types of art. He came across Rosemarie Trockel’s z.B. Balthasar, 6 Jahre (For Example, Balthasar, Age 6). 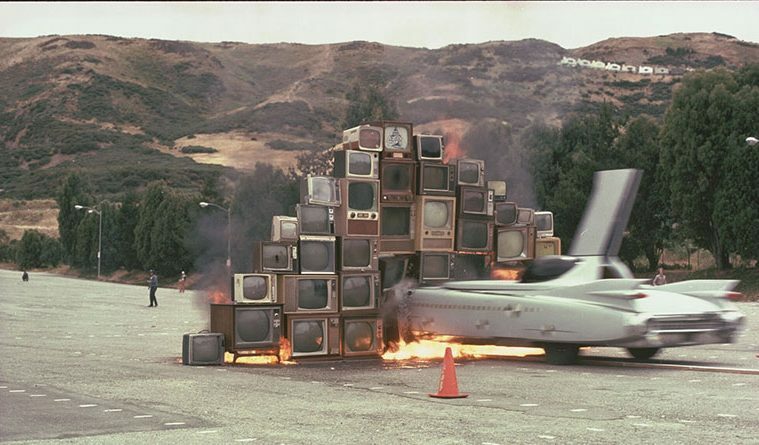 Trockel’s video work, a first of its kind for the museum, entered the collection as a gift in 1998—early in the timeline of DMA’s acquisition of film and video works—and, as Delahunty puts it, the gift “started a sort of chain reaction of the DMA quietly acquiring these types of work.” The seed was planted: Truth: 24 frames per second, the first major exhibition in the DMA’s history dedicated to time-based media, opened this fall and is on view through Jan. 28, 2018. 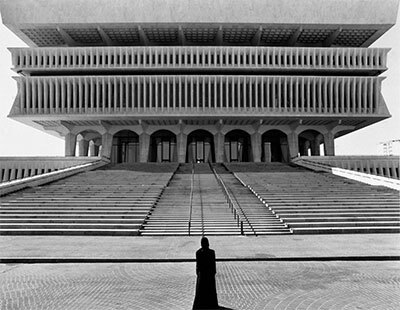 “No-one has staged something this ambitious and chronologically broad,” Delahunty says regarding the scope of the show, which features the work of 24 film and video artists—some pieces produced as recently as this year—boasting a powerhouse list of contemporary artists including Shirin Neshat, Steve McQueen, Phil Collins, Dara Birnbaum, Morgan Fisher, Tatiana Gaviola, John Gerrard, and many more. 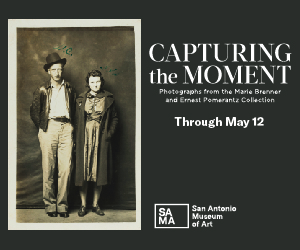 The show also includes 10 works from the DMA’s collection, several of which have never been on view in Dallas, including work by Rachel Rose and Arthur Jafa as well as a newly-restored version of Bruce Conner’s REPORT, a piece that examines the assassination of President John F. Kennedy. Delahunty cites the Steve McQueen retrospective that toured several years ago and the Whitney Museum of American Art’s Into the Light: The Projected Image in American Art which focused on film and video work from the 60s and 70s, as well as the Tate Modern’s early 2000s show Time Zones which featured what was, at the time, a selection of recent film and video, as influences for thinking about the installation of what is, for museums, still a relatively new medium. Shirin Neshat, Soliloquy, 1999, Two-channel video/sound installation, running time: 33 min. (1980 sec. ), Dallas Museum of Art, the Contemporary Art Fund: Gift of Mr. and Mrs. Vernon E. Faulconer, Mr. and Mrs. Bryant M. Hanley, Jr., Marguerite and Robert K. Hoffman, Howard E. Rachofsky, Deedie and Rusty Rose, Gayle and Paul Stoffel, and two anonymous donors; the Lay Family Acquisition Fund; and the TWO x TWO for AIDS and Art Fund 2000.320.A-B. Along with Assistant Curator Anna Katherine Broadbeck, he utilized the DMA’s collection to develop a show based around artist’s use of film and video to explore documentary, montage, and appropriation, three filmic techniques uniquely capable of exploring definitions of what constitutes truth or reality across cultures. Works like John Gerrard’s Western Flag (Spindletop, Texas), another work having its U.S. debut in Truth, which uses new technologies to reconsider the very real place of Spindletop, Texas, the birthplace of the modern oil industry, and comment on the ways technology itself impacts notions of what is real and what isn’t. Film and video don’t seem like mediums that would cause headaches for museums in 2017—after all museum audiences live with video and film all day long. But considering that most of these works are never fully considered by audiences the way that say, a painting is, mostly due to the constraints of time, we start to get an idea of how much is being asked of the audience by these artists and their work. The time needed to watch each piece in Truth from beginning to end requires over six hours in the museum. If politics and truth are at the forefront of visitors’ minds during a visit to Truth, it could certainly be forgiven, but the hope is certainly that they’ll leave the museum thinking about other aspects of the work as well—the evolution of artist’s use of the medium, the way artists pushed the boundaries, and the ways they used and responded to the technologies of their time. There’s a sense from speaking with Delahunty that Truth is an experiment—it could really go either way—but it seems as if the experiment is less in how many people attend or what the critical response is, but in how audiences engage with the work. The slow adoption of time-based media by museums may have been the result of technical or spatial constraints, but the long-term viability of the medium’s home in the gallery will involve evolving audience expectations regarding the experience of the museum itself. A far more difficult challenge to surmount.